Technology and impunity; Vajont as the symbol of "failure of engineers and geologists to understand the nature of the problem they were trying to deal with"
In 1943, the Adriatic Society of Electricity, SADE, founded in 1905 by Giuseppe Volpi, received the state concessions to kick start the construction of a dam on the shore of the river Vajont. 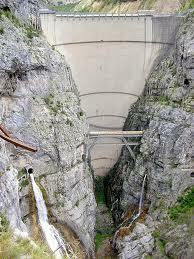 The Vajont dam was going to be among the biggest in the world at that time. The idea of using as hydroelectric basin the valley of river Vajont was realized by the Hydroelectric Veneta Company, then absorbed by SADE, particularly active at the end of the nineteenth century and the first half of the twentieth century in the electrical distribution in northeastern Italy (before nationalization of the electricity sector implemented through the creation of a National Agency for Electric Energy: ENEL). The reservoir is created for storing up the waters of the River Piave after their passage in the dam center Cadore, through which arrives in the tank of Vajont through pipes with minimum altitude. The company proceeded to carry out in record time the land expropriations necessary for starting the work, sometimes using excessive pressure and force toward local inhabitants. Within a few years, of the 5,200 acres of township, 3,000 had become property of SADE. Since the arrival of SADE on Mount Toc, local residents claimed their rights to territoriality, fighting against the expropriation of land and exposing potential flaws in the project. They formed two committees (Committee for the Defense of the Municipality of Erto and Civil Consortium for the Re-birth of Val Ertana) whose requests and complaints were never heard. On March 1963, the plant had officially become property of the new National Agency for Electricity, today's ENEL. In the meantime, the friction between the local authorities and the SADE had become very serious. A danger warning came in with a strong earthquake, estimated at around 7 degrees on the Mercalli scale, which caused the collapse of some houses, while others were seriously damaged. 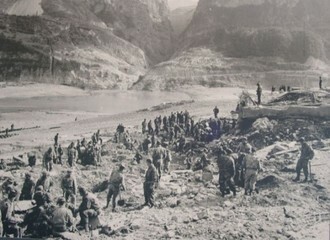 On October 9th 1963, the landslide of the slopes of Mount Toc, already in progress, took a hasty movement. The slide caused a wave surge up to 200 meters, and flooded the valley of Piave. 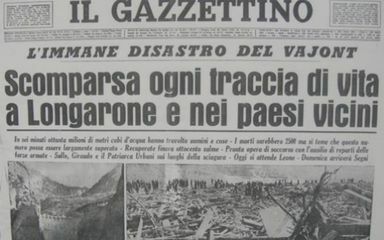 On it’s course, the wave broke in and swept away entire towns along the river valley: Longarone, Pirago, the banks of Fornace, Villanova, Faè and Castellavazzo; also, it damaged areas of Soverzene and Belluno. The final count for the accident was 1,917 victims of which 1,450 in Longaronem, 109 in Codissago and Castellavazzo, 158 in Erto and Casso and 200 from other municipalities. 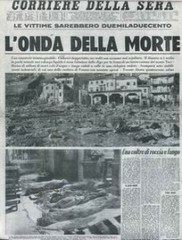 Immediately after the disaster, the issue of the reconstruction of houses and towns became very urgent and sensitive. The intent of the institutions was to relocate local population and houses, rebuilding this way social structure of communities. This plan was heavily criticized by the people and caused huge unrest and led to civil disobedience and organized demonstrations, which however led to poor results. The community of Erto was deported near Maniago, a neighboring town, and the Municipality of Longarone, the most affected, suffered the same fate. Another center called New Erto was built in Ponte nelle Alpi (Province of Belluno). However, despite economic aid, communities could not reconstruct their structure and the whole geography of the area was disrupted. 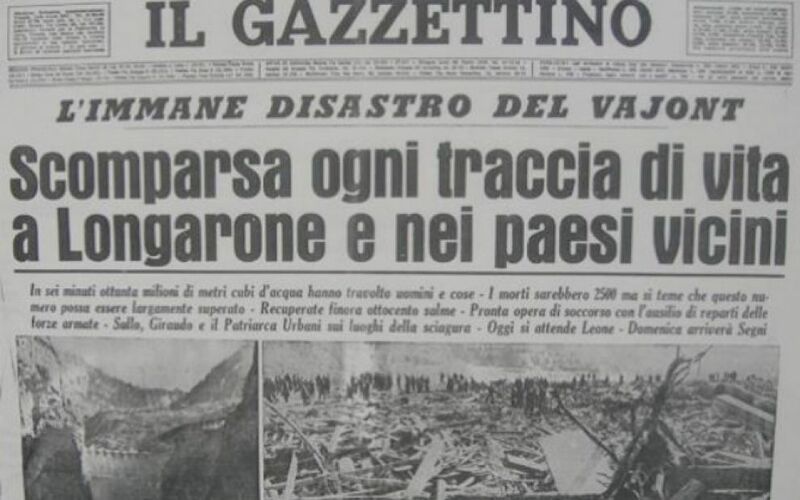 February 21st 1968 began the First Instance trial where the prosecution asked for charges of 21 years for all defendants for culpable disaster of landslide and flood disaster, aggravated by the anticipation of the event and multiple aggravated manslaughter. Biadene, Batini and Violin were sentenced to six years, guilty of failing to warn about the potential danger and of not starting proper evacuation on time; all others were acquitted. The predictability of the landslide was not recognized. 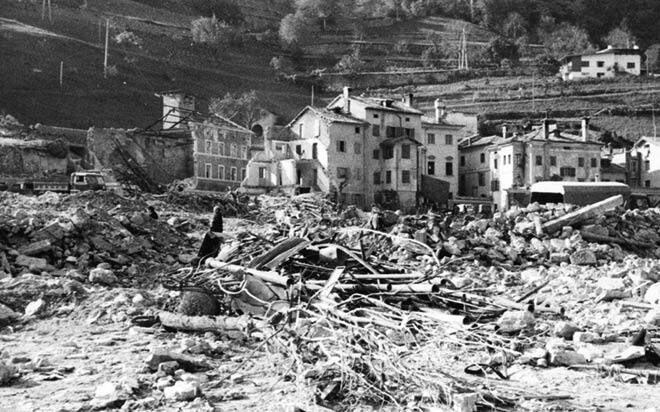 In 1997, Montedison (which had acquired SADE) was ordered to compensate the municipalities affected by the disaster. The affair ended in 2000 with an agreement for the distribution of the burden of compensation between ENEL, Montedison and the Italian government (33.3% each). 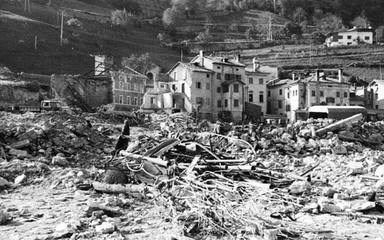 In February 2008, during the International Year of Planet Earth declared by the General Assembly of the United Nations, in a session dedicated to the importance of proper understanding of Earth Sciences, the Vajont disaster was mentioned, along with four other events, as an exemplary case of "avoidable disaster" caused by «the failure of engineers and geologists to understand the nature of the problem they were trying to deal with». Project Details The gorge of river Vajont, which arises from the Carnic Alps and flows into the river Piave, along the Mount Toc, seemed to be the most suitable place: the initial design provided a double-arch dam 202 meters high with a reservoir of 58.2 million cubic meters. Later, the project was modified: the dam would reach the height of 261.60 meters, with a profit of 152 million cubic meters. The reservoir of the dam was in effect greater than expected by all projects. The project received the full ministerial approval July 17th, 1957. The level originally planned for the structure was 677 meters, in its state of maximum capacity, but according to the retouched project, it would reach 715 meters. In fact, already at an altitude of 680, slightly above the limit indicated as safe from the government authorizations, abnormal movements had occurred on the left side of Mount Toc, movements that would soon lead to the landslide, cause of the disaster of 1963. - a progressive deterioration of the mechanical properties of the base of rocks subject to movement. - secondly, the earthworks and the incisions caused by the construction of roads and canals in the area concerned. - the presence of the artificial lake and in particular the reduction of water pressure in the coincidence of slopers. Why? Explain briefly. Despite the invasive characteristics of this infrastructure project, the corrupt policies underlying the implementation and management of the system, and the disaster resulting from the collapse of the dam, the civil society obteined some victory after the disaster. In fact, the actions of civil society and the demonstrations of local population, the intervention of local institutional figures (eg. Mayor of Erto) and journalists (eg. Tina Merlin), have forced institutions to a concrete commitment in compensation ( by Enel, Montedison and Italian State) to civil society involved in the disaster, through indemnities, the sale of licenses and more attention in the debate about the safety of mega plants (Italy, after the mega projects of the sixties, has opted for micro-hydraulics, becoming one of the most important producers in the world). Moreover Enel, today owner of the structures and of the land, opened to the public in the summer of 2002, the first part of the crown above the dam, entrusting some local associations (including the Association of Pro Loco Spar) the task of managing the guided tours. Nowadays tourists can access the entire path to the crown, to see with their own eyes the impressive scenery of the landslide of Mount Toc and the valley below Longarone.